Size: 0 - 12" 12 - 24" 24 - 36" 36 - 48" 48 - 60" 60 - 72"
L1SP 0" - 12" 0.015" 0.5"
L2SP 12" - 24" 0.015" 0.5"
L3SP 24" - 36" 0.015" 0.5"
L4SP 36" - 48" 0.015" 0.5"
L5SP 48" - 60" 0.015" 0.5"
L6SP 60" - 72" 0.015" 0.5"
In addition to our extensive line of diameter tapes, Pi Tape Corporation also manufactures PRECISION LINEAR MEASUREMENT TAPES. The standard linear tape is constructed of 1095 spring steel and is offered in various lengths. 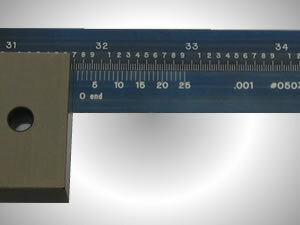 When used in conjunction with the vernier, Pi Tape brand linear tapes read to 0.001” with an accuracy of +|- 0.005” on standard range tapes up to a length of 144”. Longer tapes are available upon request. Linear tapes are manufactured with the Blue Easy to Read finish.